Usually when I'm on a great store's website and I see that they have a retail location or a list of their stores, I don't hold my breath that there will be a location near me. Here in Wisconsin, we don't seem to get as many of the fun shops that those of you out in Los Angeles or New York City are accustomed to finding on a day to day basis. What? Things just aren't as exciting here? Do they think all we have are cows? And going inside can only be described as pure, jaw-dropping amazement. You know the way that the kids felt when they first stepped into Willy Wonka's Chocolate Factory? How at first they almost froze and were speechless but still wanted to run around and touch absolutely everything? Imagine that, except with the most wonderful toys, gear and furniture for children of all ages and you have Oompa Toys. "Look at all the toys, Mommy," Big Sister E whispered to me. And I did. Everywhere we turned there were bright colors and natural, beautiful materials and items that any parent would be more than happy to allow their child to play and learn and imagine with. A friendly Oompa employee came right over and chatted with us about the store and the Monday morning story time that they had been holding (we'll definitely be there if they start it up again after the holidays!) and she even sat and built a miniature tower for Little Sister B... or tried to, as Little Sister B only gave her a very serious look and continued to move Gobblet Gobblers to the floor (see right). We checked out the blocks and the train table and the stuffed animals and the artwork and the play food and the crib bedding and the store seemed to go on and on. I had to encourage Big Sister E to put down the item she had or climb off of the gorgeous wooden rocking horses just so that we could see everything there was to offer. In the end, I'm not sure which of the three of us was the most impressed. Both Big Sister E and Little Sister B could have played for hours with all of the kitchen and store items ("Look, Mommy! Pizza!") and I could have perused the selection of strollers and diaper bags and baby gear and accessories forever. Did I wish that I could trade in most of the things in our house for an Oompa replacement? Something well-crafted and high quality and beautiful? Yes. Will we be back to the Retail Store to play and dream and imagine again? Definitely. "That was a fun store, Mommy," Big Sister E told me as we were finally leaving. "That was a REALLY fun store." It's anything your imagination wants it to be. Designed in Switzerland for children ages 2 - 7 (although we have found that Little Sister B, at 1, loves it, as do Mommy and Daddy, who are slightly older than 7), the Bilibo can be played with alone or in a group, as it inspires creativity just by looking at it. Strong enough to hold any of us standing on it and containing no sharp edges or corners, I imagine that the Bilibo will last forever. Really, the question should be: What isn't a Bilibo? So far, Big Sister E's favorite thing is to sit in the Bilibo, spin around and topple herself over, laughing the entire time. However, she has also gotten a kick out of using it as a rocking chair to sit in and read books as well as sliding herself with a scoot-scoot motion around the floor and calling herself a school bus driver. She's even pleased with herself when she finds a "good parking spot" for the bus, which I assume is hard to do with something that large, right? Little Sister B heads right for the Bilibo when entering the play room and I'm always interested to see what she might do with it next. Sometimes she must see herself as the drummer in a band, as she flips the Bilibo right over and taps away. Other days, she methodically moves play food in and out of it, obviously doing some important grocery shopping. One day I sat and entertained her for quite a while by sticking My Little Pony heads in and out of the holes from underneath the Bilibo and she loved every minute of it. Right on Oompa's website it states, "No batteries. No blinking lights. No cartoon-themed toys. Period." Whether you're shopping for a newborn, a toddler or an older child, they have an amazing variety of items that will spark creativity and imagination and delight all ages, as well as be loved by kids and parents alike for years. 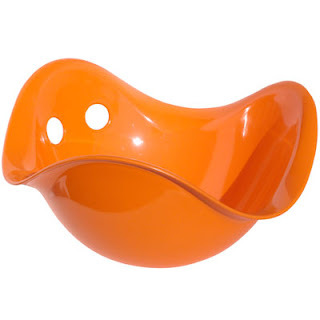 One lucky person will win their choice of color* Bilibo from Kid O courtesy of Oompa Toys! ARV $29.99! To enter to win: Visit Oompa Toys and tell me which of their amazing items(s) you would love to own AND which color Bilibo you would choose. 1 Extra Entry (per method) if you follow Oompa Toys on Twitter and/or sign up for their newsletter (found at the lower right corner of their site). 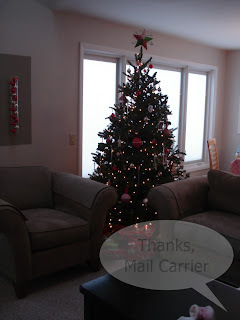 3 Extra Entries if you blog about this giveaway linking back to Thanks, Mail Carrier and Oompa Toys. Please leave an address where it can be found. *Depending on availability of stock. Oompa will of course try their hardest to get you your first color choice, though! Giveaway will end on January 14th at 11:59pm CST. Please do me the favor of leaving an email address or making absolutely sure it is visible in your profile. I have to have a way to contact the winners. The winner will be chosen by random.org and announced here as well as emailed. The winner will have 48 hours to contact me or respond to notification or a new winner will be chosen. Giveaway open to US residents only (no P.O. Boxes, please). A huge thank you to Brianna at Oompa Toys for providing a yellow Bilibo by Kid O for review as well as a Bilibo of choice for one lucky giveaway winner. The opinions shared are my own and honest and if you really need to see more, click here to see how I roll. Congratulations, Linda Russell! Enjoy your shopping spree at Ecostore USA! 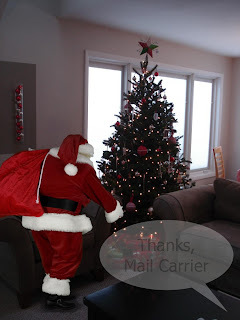 Thanks so much to everyone who entered and has supported Thanks, Mail Carrier in 2009 - I can't believe we're only days away from 2010. Where does the time go? Happy New Year, everyone! What some may call a "guest post" is what I might call "just me rambling." A few days ago Shannon, the adorably sweet writer of Coupon Mommy of 2... Now 3 approached me about writing a guest blog post for her. To which I immediately responded, "Huh?" Not knowing what to write about, ideas floated through my head for a day or two (which I left poor Shannon hanging) and I finally agreed and thought, well, sure, why not? 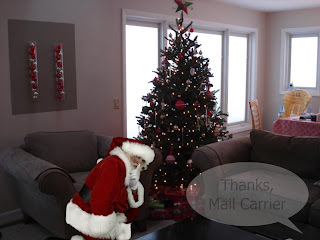 To see my oh-so-eloquent post on my thoughts about my mail carrier being Santa Claus and how I feel about my blog and my blogging friends, head on over there and check it out. While you're there, if you decide to follow Shannon's recipe and make some peanut butter balls, be sure and send a few this way because it would make my husband pretty happy. He's a big fan and, since I'm not, he has to wait for his own mother to make them for him every year. That's the holiday spirit, right? Okay. Our living room. Nothing exciting. What the? Where did HE come from? That's right, shhhh. He's a sneaky one, that Santa Claus. Thanks to Nichol over at Kiddies Corner Deals for hosting a fun giveaway from Capture the Magic, because now our Christmas morning is going to have a little extra excitement! I hope you all have a wonderful and safe holiday and get to enjoy some quality time with your families... Here's to a great end to 2009 and an even better beginning for 2010! According to Answers.com (which knows everything), there is no specific phobia term for a fear of losing something, such as personal possessions. Trying to be helpful, they do point out that athazagoraphobia is the fear of forgetting something and that if you forget where you put it, it's lost! Unfortunately, that doesn't help me. I don't have a worries about forgetting my diaper bag, my keys or my phone, I have fears of losing them. However, those thoughts pale in comparison to the ultimate fear - losing my children. Everyone hears the stories. A child is abducted or gets lost or runs away or... simply goes missing. When I hear about it on the news, I can barely think of the horror the parents are going through and how they are dealing with each passing moment of not knowing the location of their child. Thankfully, I have never been in that position, but what if I was? What if you were? As the first three hours a child is missing are the most critical for their safe return (according to the Department of Justice), would you be able to supply the necessary information to law enforcement calmly and quickly? Part of me hopes and thinks that I would be able to think rationally and supply them with the data that they need... while part of me knows that when put on the spot, I can't even remember my own phone number. Developed by AmberAlert.com, My Child ID is a digital identification device that keeps all necessary important information at your fingertips. You would be able to tell law enforcement your child's hair and eye color, but do you know their physician, medications, emergency contact information and how to contact your babysitter? That's where My Child ID comes in. 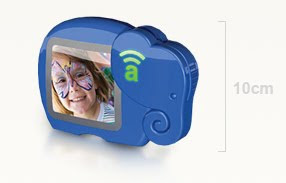 With 128 MB of storage, one My Child ID can store the profiles of every member of your family on one small elephant-shaped device (in your choice of four fun colors). 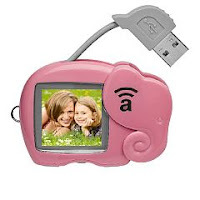 Compatible with Microsoft, Mac and Linux operating systems, simply plug the USB cable into your computer and follow the simple prompts to easily begin entering your child's information. My Child ID is even password protected and encrypted so that there is no worry of whether your child's social security number is going to be safe after having been entered. I was surprised by how many of the boxes I had to leave blank on my first attempt to create a profile for my daughters. I knew I could find out what their blood type was, the names and phone numbers for Big Sister E's teachers and the contact information for anyone who we would need to talk to in an emergency, but that would take some time. Would I know where to look when I was under pressure? I was already valuing having a My Child ID much more. In the end, it the time it takes to fill out your child's profile is well worth the knowledge that it is all organized and stored in one convenient location. The My Child ID easily fits in the palm of your hand and stows nicely in a purse, diaper bag or connected to a key ring so that it can travel with you anywhere. When turned on, it displays only the pictures that you have uploaded and no personal information, therefore making it safe to always have at hand. For yourself or your next gift-giving occasion, My Child ID is the ideal present - how often can you give the gift of safety? It even comes packaged and ready to go right out of the box (see right). Give any parent you know the peace of mind that their child's vital information will be ready if the unfortunate circumstance arises that it is quickly needed. Retailing for $39.95, My Child ID is available on AmberAlert.com as well as at select stores for a limited time. Thanks, AmberAlert.com for helping parents be proactive about their child's safety and for continuing to develop and improve such innovative technology for safeguarding children and families. And, for never losing a single letter or package, thanks, Mail Carrier. The winning never seems to end around here... but I'm not complaining! It's time to surprise two more people with emails of congratulations, something I love doing. Congratulations, Kerrie! I hope you and the Globetrotters fan in your life have fun with these prizes! Congratulations, Chacoy pronounced: Sha-coi! I hope these will come in handy for you! Thanks to everyone who entered, I hope you all have a great holiday season! Do you look at your kids (or grandkids or nieces or nephews or WHOEVER'S kids) and are just amazed by how much they've grown, too? Sometimes I can't get over the fact that it seems like one day I was excited to finally be pregnant and, what seems like the next day, Big Sister E is already three years old. She knows the look I must get when I'm getting all sentimental about her growing up because she'll look me right in the eye and say, "How did I get so big?" before I can even mention anything. That's my smart girl. Then I look at Little Sister B and my mouth almost drops with each of her accomplishments. She changed from my immobile little bundle of cuteness into this... TODDLER. She's becoming a real person, one that points so I know what toys she wants to play with or what silly things to do to make her laugh so I can hear that sweet sound. What amazes me the most is watching her walk along furniture with ease. At first all Little Sister B could do was pull up and stand there, then she began to take just a step or two. Now, she strolls along the edges of things with the confidence only a new discovery can give to a child. As well as being there with the camera, I am sure to help my little one out by giving her the best footwear for her growing feet. 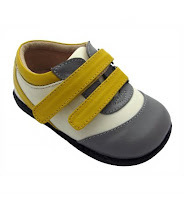 All of ELK Kids' Soft Sole leather shoes are made from high quality baby safe soft leather and the color doesn't rub off onto little socks when they are worn. 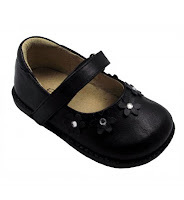 These adorable shoes are not only comfortable for Little Sister B's feet, the adjustable elastic keeps them on and helps prevent her from slipping while she's navigating her way around the house. An added bonus? If they get dirty, these shoes can be tossed in the washing machine (on the gentle cycle) or are easily wiped clean with a damp cloth. Size availability varies on the soft sole shoes, but they run anywhere from 0-6 months up to 3-4 years, showing the quality and durability can withstand anything from crawling to running. 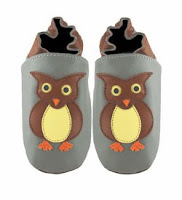 The styles of Soft Sole Baby Shoes at ELK Kids are endless. I felt as though I could browse for days through the cute animals, trendy patterns and unique designs. Whether you are shopping for a boy or a girl or getting a pair for an unknown baby-to-be, I guarantee that you'll find more than a handful of designs that you'll ooh and ahh over. Little Sister B's Monkey yellow shoes are the perfect thing to pull on her feet, whether just to keep her socks on around the house or if we're heading out to play with friends. I chose the neutral colors so that they will go with everything and anything and besides, don't those little monkeys look suspiciously like they're up to something? Definitely fitting for my little curious go-getter. If soft sole shoes aren't your thing, ELK Kids also has the most adorable line of Flexible Soled Toddler Shoes that run from a size 4 to a size 10. From dressy to casual, these shoes are not only stylish but comfortable as well. The leather is soft and relaxed and the soles provide a good amount of traction for older kids' quick (and not always graceful) movements. I love how the Toddler Shoes at ELK look unique in a tasteful way. These shoes are fashionable without being so overly different that they would get left in the closet and the colors match to outfits worn year-round. The adjustable Velcro on the top of Big Sister E's Ella shoes even make it so that they can be perfectly fit to her feet for as long as she wears them (and then later on when Little Sister B grows into them, too). If you're looking for a great price on kids' shoes right now, check out ELK Kids' clearance page for an even better deal on their adorable footwear. 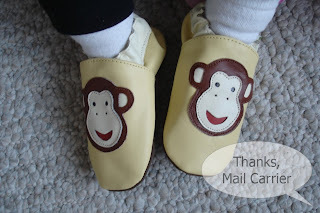 Little Sister B's Monkey yellow shoes are on sale for 40% off (making them only $14.99 from their original $25) as well as other of their Soft Baby shoes and cute boots. If that isn't enough, from now until December 31, 2009 enter the coupon code b87a9ef83e and you'll receive a 15% discount off of your total purchase. Yes, this includes both regular and clearance items and even gives you free shipping on orders over $50! Time to stock up for baby gifts, birthday gifts or just preparing for when your child outgrows the current shoes they are now wearing! Also be sure to become a fan of ELK Kids on Facebook and you'll be on top of all of their new information and deals. One person will win their choice of shoes from ELK Kids! To enter to win your choice of shoes from ELK: Visit ELK Kids and tell me which style(s) are your favorite. It will be hard to choose just one! Please do me the favor of leaving an email address or making absolutely sure it is visible in your profile. I have to have a way to contact the winner. 1 Extra Entry (per method) if you follow ELK Kids on Twitter and/or subscribe to their newsletter (be sure to check the Subscribe to Our Newsletter box). 3 Extra Entries (leave 3 separate comments) if you blog about this giveaway linking back to Thanks, Mail Carrier and ELK Kids. Please leave an address where it can be found. Giveaway will end on January 7th, 2010 at 11:59pm CST. The winner will be chosen by random.org and announced here as well as emailed. The winner will have 48 hours to contact me or respond to notification or a new winner will be chosen. Giveaway open to U.S. residents only. 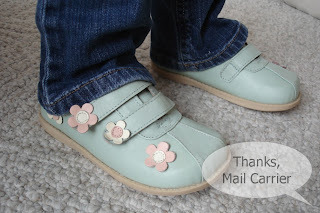 A giant thank you to Joan at ELK Kids for providing us with two pairs of shoes to review as well as one for one lucky giveaway winner. We love how well-made, comfortable and stylish they are! The opinions shared are my own and if you really need to see more, click here to see how I roll. I've been fortunate that I was able to learn about and try multiple of SproutBaby.com's products in the past (see my Sprout Foods Baby Food review or my giveaway for a thinkbaby stainless feeding set) and most recently, I was happy about the great discount that SproutBaby ran for Cyber Monday. I spent quite a while over on their site trying to decide what to purchase while taking advantage of that sale (and ended up really pleased with my selections)! While I was there, I was amazed at all of the new items that SproutBaby has added since my last visit. 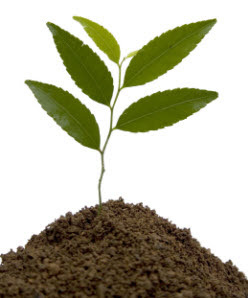 As they have always focused on having exceptional products that are both healthy and environmentally-friendly, SproutBaby upholds extremely high standards and promises to ensure that everything they offer their customers has the safety of the family and the health of the planet in mind. Do you know a lot of other companies that do that? I don't. When SproutBaby asked if I would like to review a few products from their new lines, I knew right away that they would be high quality, safe for my kids and good for the earth. It wasn't really a hard decision. BabyGanics is a company founded by two clean-freak fathers who were determined to make products safe for the planet and safe for people. Sound like a good match for SproutBaby? 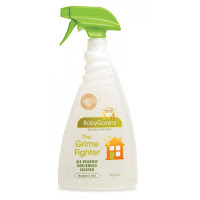 I love the 2 ounce sample of The Grime Fighter All-Purpose Household Cleaner that I have been able to try, as it is the perfect thing for cleaning absolutely everywhere while still being safe for my children. Made out of mainly plant-based ingredients, this All-Purpose Cleaner can be used on wood, marble, plastic - you name it. Available on SproutBaby.com for $6.99 for a 32 ounce bottle, for that price you'll be set to clean your entire house safely for quite a while to come and leave you with a clean conscience. Episencial is the first company to develop all natural and sustainable skin care specifically for today's actively healthy families. Not only do I love that they are made with all natural ingredients, packaged in sustainable and recyclable materials, but they feature the artwork of Eric Carle and The Very Hungry Caterpillar. How cool is that? Their 8 ounce bottle of Better Body Butter (which sells for $9.99 on SproutBaby) is perfect for keeping my family's skin soft and hydrated this time of year. 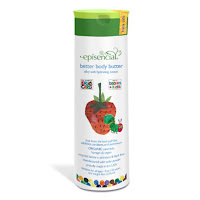 Episencial has made this great Body Butter for ages 0 - 150, so I know that it is safe for all of us and I love knowing that it is boosting our skin's immunity while keeping us hydrated. This would be great on a newborn, as it is said to also prevent cradle cap and scaly skin, something both of my daughters suffered from as babies. Having never heard of Nature Babycare before, I was surprised to learn that there is a biodegradable option of disposable diapers available. What a great concept! Consisting of 99% compostable material, these diapers are kind and gentle to your baby AND the environment and retail for $11.99 a pack (diaper count varies depending on size). I found them to work wonderfully, they fit Little Sister B well and she was able to move freely and not have a single leak. 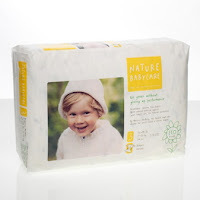 Based in Sweden, Nature Babycare has worked for years to develop the greenest, eco-friendly, breathable, high-performance, chlorine-free diapers available on the market. 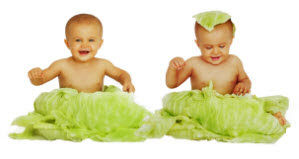 I greatly appreciate SproutBaby not only carrying them, but for their stance on providing an atmosphere on their website that is free of judgment and restrictions when it comes to diapering choices. Whether you decide that cloth or disposable are right for your family, they will stand by you and aid in helping you make the healthiest choices possible. The final item that SproutBaby sent me may possibly be my favorite, just because it is so simple and useful. 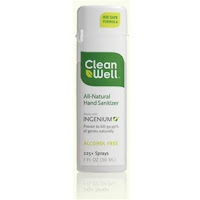 CleanWell 1 ounce Hand Sanitizer Spray kills 99.99% of germs that can make you sick with one simple spritz, yet is is all-natural and alcohol-free. The ingredients are safe for kids, non-toxic and come from rapidly renewable resources that grow abundantly worldwide. Did I mention that it's amazingly easy to use as well? Each bottle is conveniently small-sized to carry along with you anywhere and flip top is so easy to pop open with just on hand. I was never a big fan of dropping a big goop of traditional hand sanitizer on Big Sister E's hand and trying to get her to quickly rub it in before it slide through her fingers... and then making sure it was completely dry before she touched anything anyway. With CleanWell, all it takes is one quick spray and I know that I'm safely keeping my family clean and healthy while banishing away the germs that are everywhere. The fact that it is gentle on our hands and has a fresh, clean scent are definitely added bonuses. One bottle retails at SproutBaby for only $4 and contains 200+ sprays. If you haven't visited SproutBaby.com, you're missing out on all of their wonderful food, toys, baby products, mom products and much more! And if you haven't checked them out lately, you'll be surprised at all of the great new products that they have added. Be sure to enter the coupon code SBBL049 on your first SproutBaby order to receive an extra 15% discount! Thanks, SproutBaby.com, for helping parents everywhere see that making healthy choices and making easy choices don't necessarily have to be separate ones. Not only do you work to help customers make smart, practical decisions for their children and family, you encourage them to communicate with each other and with you with their comments or questions and that's really wonderful. Even though we don't communicate much more than a wave or a "How're you doing today?" when you come by, thanks for another great delivery, Mail Carrier. You worked hard for me in 2009 and I greatly appreciate it. Happy Holidays! In preparation for a baby shower that I attended recently, I looked over the pages of the registry for the parents-to-be multiple times. I wanted to purchase items that they wanted, of course, but as a seasoned mom, I also wanted to get things that were somewhat practical and useful. Then there's the wow factor. A box of diapers? Yes to useful, but no to wow. Those really fancy and expensive baby blankets? Yes to exciting, no to practical. One spit up on them and they're done. Plus, they'll get lots of those. I wanted something that was unique, functional, cute, fun, unforgettable and affordable. Is that too much to ask? I would have sat and privately gloated about bringing the coolest gift, too. Apparently, Cindy Hoeppner knew that there are people like me out there when she created Mitetees and changed traditional gift-giving into a way to give something unforgettable. Based on the idea of celebrating parenthood with cute, smart designs and practical garments, Mitetees offers clothing for new babies, birthdays, siblings or just anytime that you want your child to break the mold and look especially stylish. The only difficult part about ordering an item from Mitetees is deciding between all of the amazing designs. Available in onesies in sizes 3-6 months, 6-12 months and 12-18 months and tees in 2T, 4T and 6T there is a style for any age of childhood. Not only is your order customized exactly to fit your needs, you also have four font color options and can select between short or long sleeves. 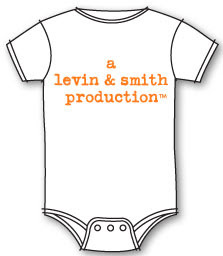 Giving a new baby gift for twins and you're not sure how the Production onesie (shown above) would work for two? Mitetees has you covered with their set of two Twins design (shown at right). 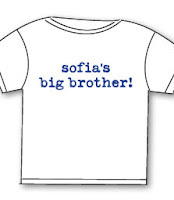 You can even have the wording written in different colors to help tell an identical set apart! 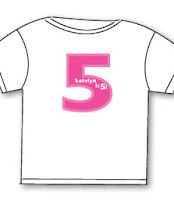 Looking for a birthday shirt that will get more use out of it than just the one day? Order your child (or grandchild or niece or nephew...) Mitetees' Another Year Older tee (shown at left) and they will be able to enjoy having their name and age displayed for the entire year... and outgrow it just in time to order one for next year! I had such a great time looking at all of the designs that Mitetees offers, that it was extremely difficult to choose ones for Big Sister E and Little Sister B. I wished I had ordered the Big shirt (shown at right) for Big Sister E before Little Sister B was born instead of getting her one of those boring traditional Big Sister shirts that we found. But I wanted styles that would fit their individual personalities as well as really wow everyone who saw them. Little Sister B's Protect Your Production shirt is perfect. It is thick and soft and the lettering is printed on without showing any possibility of coming off (even when I picked at it to check). 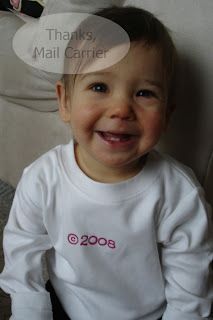 I love the simple, understated way the copyright symbol and the year she was born stand out against the white shirt and the way that it takes people a second or two to look at it, comprehend and go, "Oh, hey! That's really cool..." My second choice for her was the Patent design (shown below), as she is definitely my exclusive, one-of-a-kind little one. When Big Sister E wears her Made shirt, we turns heads wherever we go. 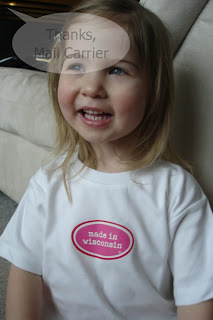 The colors are vivid and bright and everyone loves that it says "made in wisconsin." This would also be a really fun shirt to give a child before or after moving to commemorate where they're from (the shirt can be customized for a state, city, town, you name it)! Or it's just plain fun to wear around and give a thrill to everyone you see. One person will win a onesie/tee from Mitetees of their own! Winner chooses the design! To enter to win your onesie/tee of choice from Mitetees: Visit Mitetees and tell me which design is your favorite. Please do me the favor of leaving an email address or making absolutely sure it is visible in your profile. I have to have a way to contact the winners. 1 Extra Entry if you sign up for Mitetees mailing list (found at the bottom of their homepage). 3 Extra Entries (leave 3 separate comments) if you blog about this giveaway linking back to Thanks, Mail Carrier and Mitetees. Please leave an address where it can be found. 5 Extra Entries (leave 5 separate comments) if you make a purchase from Mitetees before this giveaway ends. Let me know what adorable item(s) you chose! Giveaway will end on January 7th, 2010 at 11:59pm CST. The winner will be chosen by random.org and announced here as well as emailed. The winner will have 48 hours to contact me or respond to notification or a new winner will be chosen. Giveaway open to US residents only. A huge thank you to Cindy at Mitetees for providing two shirts for review as well as one for one lucky giveaway winner. We LOVE looking so cool in them! The opinions shared are my own and if you really need to see more, click here to see how I roll. Two great giveaways ended last night and I really loved reading the comments about which SodaStream flavors you would like to try and which images you thought were especially gorgeous from Sweet Arts Design. Congratulations, Amy! Amy already responded and her daughter is happy to be welcoming Lilly the Dalmatian into their home very soon! Congratulations, Kim! Those extra tweets paid off and I hope you enjoy making this great book for a special little one in your life. Finally, you have no idea how much it means to me to close my SodaStream giveaway with 727 entries. That is a new record for me and having all of that great support is like one big hug from all of you... so maybe that explains why I'm reaching out and giving my computer a big hug in return to pass back to you... c'mon on, go ahead and take it... too weird? Okay, I'll stop. But really, thank you all so much for coming by and entering, I wish I could give a SodaStream machine to each and every one of you! Congratulations, bettycd! I hope you enjoy making your own soda from the comfort of your kitchen! Thank you again to everyone who entered, you all rock! Get your entries in for the other great giveaways that are up and running now and for the other great ones that are coming up soon. Happy Holidays to you all, as well! Have you ever watched those infomercials on television and thought, "Now, that surely can't actually work" or "Well, right. As if I'm supposed to believe that," when they showed their amazing products? I know you have. I'll admit it. When Hazelaid sent me Soap Nuts to use in my washing machine, I was skeptical, but definitely interested and willing to try them. My husband, on the other hand, took one look and said, "You are NOT washing our clothes with those things," before walking away. Right then I knew the test would be if he could tell the difference in his clothes when the time came that I did use this unique way of getting even our dirtiest items clean and fresh. What are Soap Nuts? They're actually not a nut at all, they're the dried fruit from the Chinese Soapberry tree (seen at right) and have been used for ages for washing clothes. As Soap Nuts get wet, they release saponin (a natural cleaner) and, when placed in the washing machine, leave your clothes not only clean but soft and vibrant as well. Whether you have allergies, sensitive skin, are washing cloth diapers (they're great for this - check out Hazelaid's FAQs for more cloth diaper information) or just want a natural way to wash your clothes, Soap Nuts are gentle enough to do it all! Hazelaid's Soap Nuts come with very easy-to-follow instructions, as there isn't really all that much to them. 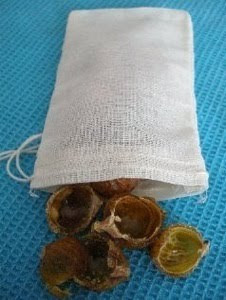 Simply put four Soap Nuts in the provided cotton bag, tie it closed and toss it in the wash along with your dirty clothes. The only added note is that warm water helps release the saponin, so if you are washing your clothes in cold water, it is best to soak the bag of Soap Nuts in a little warm water first and then stick them (and the water they soaked in) into your machine. Sounded easy enough, so I gave it a shot. I washed two loads of laundry with my new Soap Nuts and after pulling them out and opening up the bag to see how much they had changed, I found that they looked only a slight bit thinner and with less saponin than they originally had. According to Hazelaid, when the shells are depleted and thin and have no shiny pockets of saponin left is when they are to be discarded (they should last around 4-5 loads) so these definitely could still be used for a few more wash cycles. I also definitely noticed the Soap Nuts had the vinegar smell that Hazelaid mentioned, but that every article of clothing came out completely fresh and clean, not a trace of dirt or a hint of odor. Hazelaid suggests adding a few drops of essential oil to the Soap Nuts if you would prefer a scent, but I like my clothes unscented and was pleased with the clean smell that I found on them. As Soap Nuts naturally don't produce a large amount of suds (nature doesn't add any chemicals to create bubbles) they were great in my high efficiency washing machine. Even better, the Soap Nuts helped to get rid of some of the chemical residue built up in my machine from all of the previous washings that I've done. And when I'm done with them, Soap Nuts are 100% biodegradable. Good for my family, good for the earth. 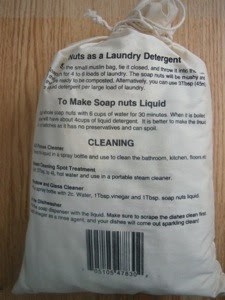 The only issue I experienced with using Soap Nuts was not being used to having to pull them out when moving the clothes from the washing machine to the dryer. In both of my test loads, I had a hard time finding the small pouch of Soap Nuts and even ended up shaking out individual items of clothing to find it so that it would not get dried. You have to keep your eyes peeled for that little bag! Visit Hazelaid to find out more about Soap Nuts, as well as their wonderful Hazelwood and Amber jewelry and how they could help with acid reflux, eczema, rashes, constipation and many more ailments... plus, they look beautiful! If you're not sure, spend some time browsing their testimonials from the many satisfied Hazelaid customers that are now believers. Speaking of which, my husband never had any idea that his clothes were washed with Soap Nuts, so apparently they passed my test! Become a fan of Hazelaid on Facebook to keep up with their latest news and information and, thanks to their generosity, one person will get to do more than just try out Soap Nuts - they'll get to do 150-200 loads of wash with them! One lucky person will win (1) 500g bag of Soap Nuts, enough to do 150-200 loads of laundry! ARV $22.95! To enter to win your 500g bag of Soap Nuts: Visit Hazelaid and tell me one of their other great products that you like AND why you would like to try their Soap Nuts. Please do me the favor of leaving an email address or making absolutely sure it is visible in your profile. I have to have a way to contact the winners. 1 Extra Entry if you visit and join the Hazelaid Community. 3 Extra Entries (leave 3 separate comments) if you blog about this giveaway linking back to Thanks, Mail Carrier and Hazelaid. Please leave an address where it can be found. Giveaway will end on January 1st at 11:59pm CST. The winner will be chosen by random.org and announced here as well as emailed. The winner will have 48 hours to contact me or respond to notification or a new winner will be chosen. Giveaway open to US and Canadian residents only. A big thank you to Severine at Hazelaid for providing a sample of Soap Nuts for review as well as (1) 500g bag for one lucky giveaway winner. The opinions shared are my own and if you really need to see more, click here to see how I roll. Always Room For Another Winner!